The route you get is determined by your sea service. Classes are available in both online and classroom settings. - OUPV - 6 Pack Captains License courses available in a classroom or online. - Classroom: Thursday night, and all day Friday, Saturday, and Sunday for two weekends. - Online Captains License courses: 24/7 for 26 weeks + proctored exam. - National Maritime Center approved for original issuance, renewal, and re-issuance of a merchant mariner credential as an Operator of Uninspected Vessels (OUPV). Fee: $695, includes all course materials (manual, plotting tools, charts, rules book) and one sitting of your proctored exam. Lessons: Lesson are divided into four modules, just like the exams. - 90 days in the last 3 years. This is called recency. - For Near Coastal endorsement, you need at least 90 days of the 360 day either on the Great Lakes and/or seaward of the boundary line (off the coast) . 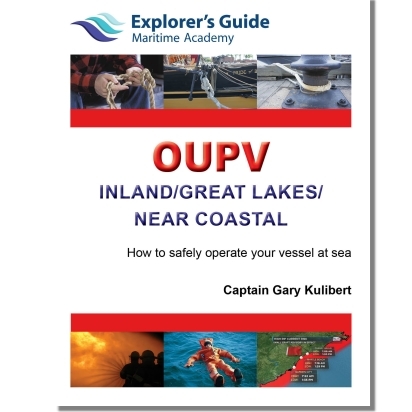 Exams: OUPV - 6 Pack Captains License has four exams. If you fail one exam, you can retake that exam over twice more. If you fail it a third time, you repeat the class. This is the National Maritime Center's directive. Plotting: 10 questions. Need 9 correct. Navigation General: 50 questions. Need 35 correct. Deck General, Safety, and Environmental: 50 questions. Need 35 correct. If you follow along in class and do a little added studying at home, you have a high percentage of passing these exams the first time. Please visit our license help page for detailed requirements for obtaining the OUPV captains license. Have more questions? Feel free to call us at (920) 733-5500.